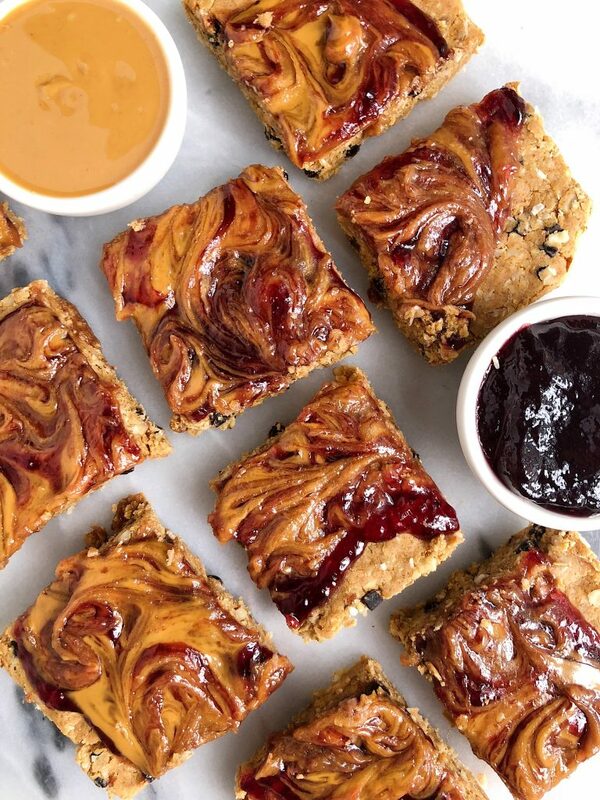 No-Bake Peanut Butter & Jelly Snack Bars made with vegan and gluten-free ingredients for an easy homemade snack! Will the peanut butter & jelly love affair ever end? Most definitely not in my world. The recipes using this epic combo just keep on getting better and better. Today we are making simple No-Bake Peanut Butter & Jelly Snack Bars. They are gluten-free, dairy-free and have zero refined sugar in them (thank you homemade jam!). 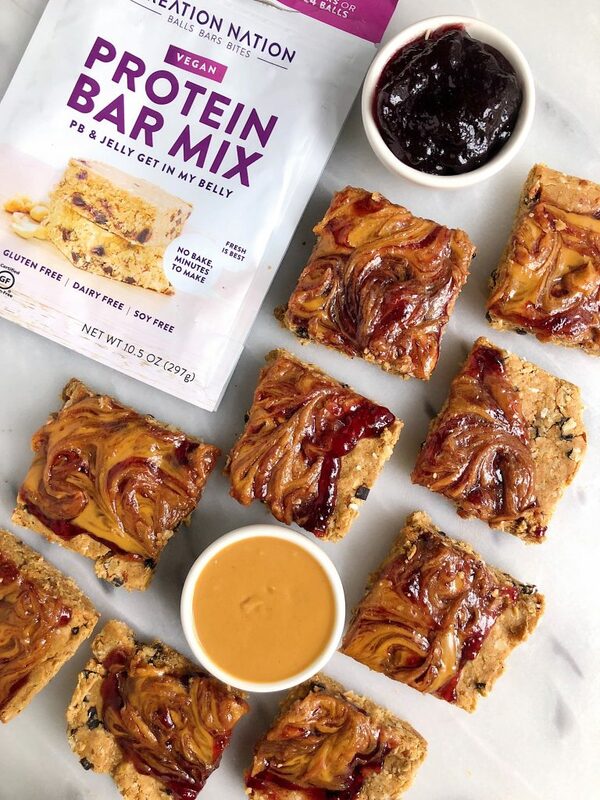 These bars are topped with an epic peanut butter and jelly swirl that adds the best flavor and extra somethin’ somethin’ to the bars. But let’s talk about the crust and base of these bars because that is my favorite part. Back when I was at Expo West last March, the founder of the brand Creation Nation, came over to me to introduce herself. Karen was so passionate about the new product she was launching and was walking me through the flavors, why it is so special and had asked me to give it a try. I am always so excited to find new products that are made with ingredients that I truly love and when the brand itself is something I think will make an impact in the industry. Creation Nation is most definitely one of my newest favorite brands. Creation Nation makes protein bar and ball mixes that you can make at home. Think baking mixes except for protein bars and balls and no baking is required. She has vegan varieties and all of them are gluten, soy and dairy-free. I love that they are encouraging consumers to make their own food, control the sugars and ingredients while also providing delicious inspo and a base for each DIY bar or ball. Their ingredients are all non-GMO and organic and have no artificial sweeteners or anything creepy in them (winner in my book). 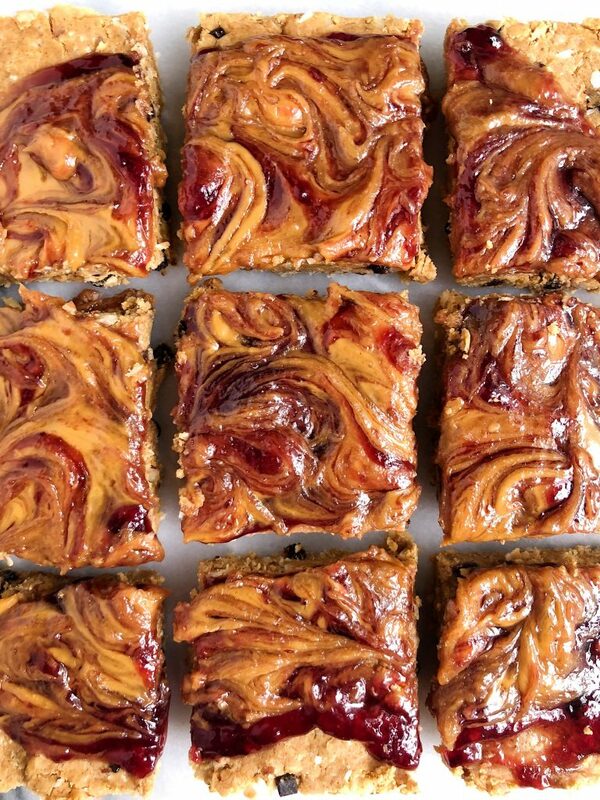 I used their Vegan PB&J Protein Bar Mix to make these No-Bake Peanut Butter & Jelly Snack bars and I am obsessed. I have used this mix twice now and both times I ate half a batch in two days. Jord was doing Whole30 so you know what that means….more snacks for me! You can find their mixes in a variety of retailers (just look at their site) or you can order over on Amazon for convenience. I cannot wait to hear what you guys think of these bars. I have a feeling you are going to love them as much as I do! If you make these bars, please share with me over on Instagram. ENJOY! Store bars in the fridge for up to a week or freezer for a couple months! Thank you Creation Nation for sponsoring this post! It means so much to me to work with brands I love and believe in on the blog! Anything else we can use other then the protein mix? I can’t find this at any of my local stores.